Johnson RK. Stabilization of the distal ulna by transfer of the pronator quadratus origin. Clin Orthop Relat Res. 1992;275:130-2. Stuart PR. Pronator quadratus revisited. J Hand Surg [Br]. 1996;21:714-22. Johnson RK, Shrewsbury MM. 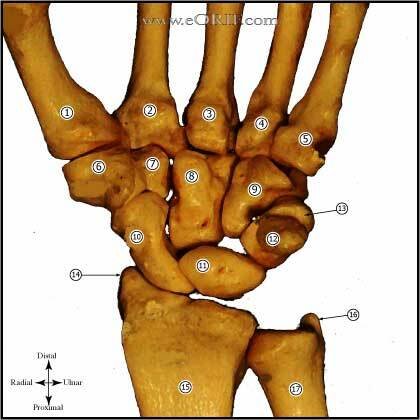 The pronator quadratus in motions and in stabilization of the radius and ulna at the distal radioulnar joint. J Hand Surg [Am]. 1976;1:205-9.
typically arises from the radial side of the median nerve 5cm proximal to the radial syloid and passes distally just under the FCR tendon. It passes through the transverse carpal ligament radial to the longitudinal axis of the ring finger to supply sensation to the palm. (Hobbs R, J Hand Surg 1990;15A:38) Injury can lead to painful neuroma. becomes subcutaneous 5-10cm proximal to radial styloid in the interval between brachioradialis and ECRL. It bifurcates before wrist. Dorsal branch 1-3cm radial to Listers. Supplies 1st and 2nd web spaces. Palmar branch passes within 2cm of 1st dorsal compartment provides sensation to dorsolateral thumb after passing directly over EPL. 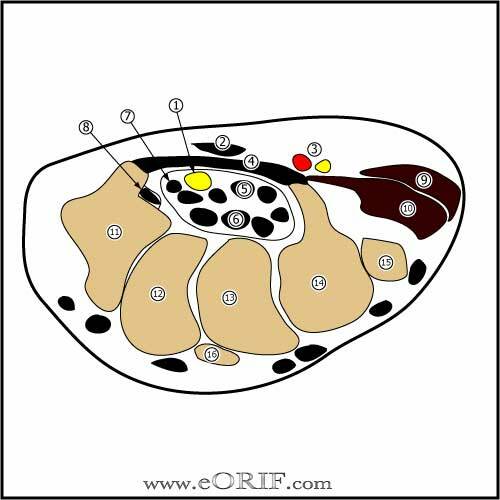 arises from the Median nerve @4-6cm proximal to the volar wrist crease and travels between the FCR and median nerve. Supplies sensation to the thenar area. 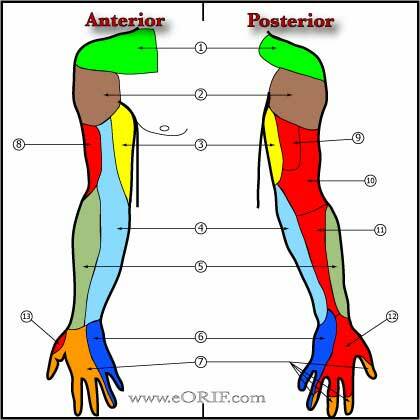 a guideline for locating the recurrent motor branch of the median nerve. Recurrent branch is located at the intersection of a line drawn along the ulnar border of the middle finger, with a line drawn between the radial aspect of the thumb web space in abdcuction and the pisiform. approximately 4cm long beginning to the proximal extent fo the transvers carpal ligament and ending at the aponeurotic arch of the hypothenar muscles. Ulnar nerve bifurcates into the superficial and deep branches within Guyons canal. Ulnar artery is radial to the ulnar nerve.